I feel in love with the idea of the complete FM-ers rig when Yaesu introduced their FT-8900 - 10, 6, 2 and 440 in one radio - COOL! Then came the question of antenna(s) - there were only two marketed options - a Comet and a Diamond quad-band antenna. I broke down and bought one of them, used it for awhile, not very impressed with in on any band, until it hit a parking thing or tree branch and snapped about 8 inches from the top. I bandaged it for awhile then bought the other quad-bander to see if it somehow would perform better - nope. But we can "fix this." I recall the Motorola Syntor commercial low-band radio - it spans 30-50 MHz in one unit - and was popular among 6 and 10M fans sometime back. The question for Motorola then and for us now is what antenna can you use that works covering 10 meters AND 6 meters? Their answer was obviously that there isn't one - you need to use two. 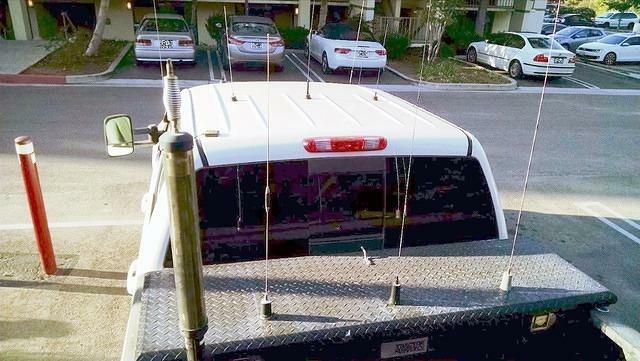 How do you make two antennas work on one radio? Well, hams have been doing this for years - fan-dipoles, multi-driven element yagis, etc. - resonance and phasing and decoupling. 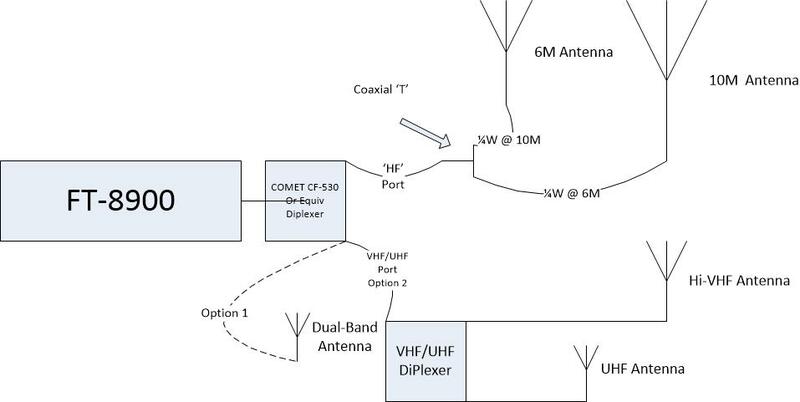 Of course we've been using multi-band couplers, what are popularly called diplexers (which are NOT duplexers per-se) to split dual-band antennas to two separate radios, or a single-dual-band radio to two separate antennas. Motorola's answer came in the form of an application note with charts describing how to decouple two antennas with coaxial phasing lines! I put the values from Motorola's chart into a spreadsheet and worked out the numbers to extend the chart down to 10 meters and up to 6 meters. There are two (maybe more) possible iterations of my scheme. I started out connecting a spare Comet CF-706A or Diamond MX62M to the output of my FT-8900. This gives us a UHF/VHF port for a dual-band 2/440 antenna, and an 'HF' port for the 6/10 split antenna construct. I started out connecting the UHF/VHF port to a VHF/UHF diplexer so I could deploy separate antennas for 2 and 440. My next iteration will be to do away with all of the diplexers and create 4 decouplng lines tied to 3 'T'	connections, saving space, clutter, cost and signal loss. 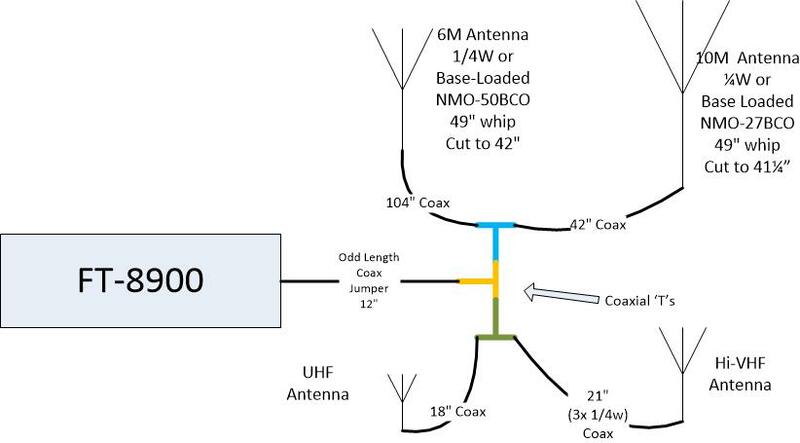 What you'll get out of this are unique good-performance antennas for each band of interest - and BTW - substitute a 5/8-wave for 2 meters, a +5 dBd collinear for 440, and full 1/4-wave antennas for 6 and 10 and the construct will work the same. At home - mix and match yagis for any band! This is the kind of experimentation that produces measurable results from known properties of RF systems. How does it look to the radio? Based on checks with an antenna analyzer - sweeping each band reveals a well-tuned ~50 ohm antenna with <1.8:1 SWR on each band. (BTW - the same principle works with dual- and tri-band rigs!!! - A step up from a prior GMC Sierra 1500 install, but all according to GM and Don Johnson best-practices. No whine. No voltage sag. No ignition/injector/fuel pump noise. No charge system or other vehicle issues. No stray RF. 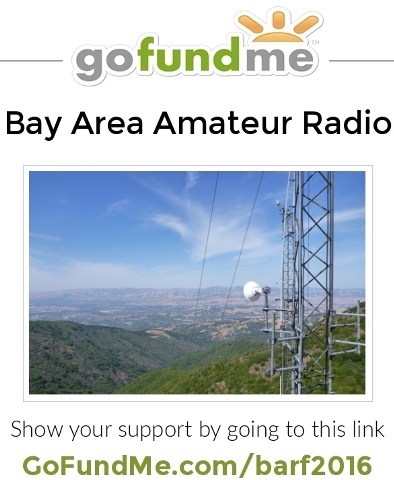 Please help support our Bay Area Repeaters!